The cover of Time magazine 3/2/15 features an Anglo baby (so remarkably cute one wonders whether he isn't a computer generated composite of everything we like about babies) with the statement (not question, statement) THIS BABY COULD LIVE TO BE 142 YEARS OLD. This suggests that inside the magazine, there might be something, perhaps a scientific breakthrough, which could support that headline. But none is forthcoming. The series of articles runs for nearly 20 pages of confused reporting on things that may or not be happening and a constant mis-understanding of the difference between lifespan and life expectancy. I know you already know this, but let me just say it, so I feel better: lifespan is how long the animal lives, based on fricking forever evolutionary mechanisms; life expectancy is how long members within the animal species can expect to live. As more individuals in the species get closer to the longest possible lifespan, the life expectancy grows and the two numbers converge. "No one lives forever, no one. But with advances in modern science and my high income level, it's not crazy to think I can live to be 245, maybe 300." -Ricky Bobby, Talladega Nights (movie 2006). "Scientists believe that the first human being who will live 150 years has already been born. I believe I am that human being." -Chris Traeger, Parks and Recreation (TV program 2009). Aubrey De Grey is a Cambridge grad (originally, I said Oxford and was corrected by Dr. de Grey himself - just one of those lazy American mistakes) who has started a non-profit organization to fund gerontology research in California. He is obviously a genius, almost too smart to give a good TED talk. But that doesn't mean that he is right about how we die. He views the human body as a machine, an admittedly very complex machine, that good science needs only to practice the right maintenance on to ensure long health. He is said to have proposed that the first human to live to 1000 has already been born, but I can't find a reliable source for that one and he certainly must have added a "in principle" or something of the sort. The disease model which drives our current thinking in medicine rests upon the idea that each symptom or discomfort is due to a proximate cause. Either something foreign acting on the body, or a breakdown of normal physiology. Medical "cures" involve correcting the breakdown, removing the foreign process, etc. It is an engineering model and works pretty well for things like kidney stones and fever. Very good scientists who have solved difficult problems in other fields are likely to think that that death is just a problem to be solved, like anything else. For the people who are trying to (let's just listen to how this sounds) stop humans from ever dying, that means figuring out what the proximate cause of cell death is. One such proximate cause seems to be telomere dysfunction. I must admit I tried to include a few paragraphs on telomeres in this spot, but I don't want to get into a detailed argument about a concept that is wrongheaded. Let's just skip ahead: it's not going to be the telomeres. Why? Because the complexity of the body does not allow for any single simple solution to be the on/off switch for death. If it were that easy, we likely wouldn't be here. Complex organisms are composed of such complexity because redundancy, feedback and adaptability lead to survival. Switch the telomeres and I promise it gets noticed and fixed, or causes worse problems. I wish these geniuses would go work on the common cold, or baldness, or how about the almost universal problem of presbyopia. I say, presbyopia first, all other age problems after that! We can take these facts as indicating that men lived a similar length of life in ancient Greece as they do today (and in the case of Plato's ideal Republic, women too). In fact there is documentation of the longevity of at least the richest Athenians of the time when Socrates roamed the streets arguing with people. In a 2008 paper examining the lifespan of famous aristocratic Athenians, Menelaos Batrinos "identified 83 whose date of birth and death have been recorded with certainty." They found a mean length of life of 71.3 +/-13.4 years. It is the "+/-" that concerns us here: How long did the longest living men go, in a time without vaccines, antibiotics, chemotherapy . . . pants? In a nice table, which I don't want to steal for this article, Dr. Batrinos shows that among the 83 men, ten of them lived longer than 90 years, three of those were centenarians and one, Gorgias (who must have been that same Gorgias Plato portrays hangin' with Socrates?) lived to 108 years old. We have no reason to suspect that Gorgias was the longest lived Greek ever, he is simply someone for whom we have a number. Considering that our most recent record holder, Jeanne Calmet (French) died at 122 years old in 1997 and was famous for no other reason than this, we seem to still consider these ages shockingly long. In fact, the current oldest known age at death for any man is 116 (Jiroemon Kimura, Japan 2013), just 8 more years than Gorgias from 483 BC. I think this makes the chances for Chris, Ricky, Aubrey and that Time baby to reach their goals seem quite slim indeed. From The Centers for Disease Control, U.S. This table shows the oft-mentioned shorthand that average life has increased from about 50 years of age to near 80 today. An idea that projects that we are "living longer." Note that the increase in the number of people reaching old age long precedes almost anything useful that's happened in medical treatment. 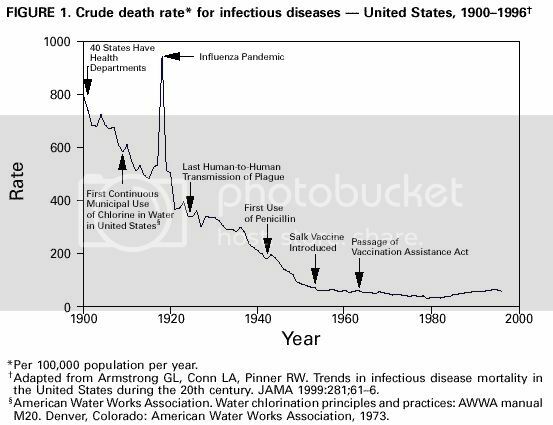 Fully 3/4th of the reduced early death occurred before the invention of penicillin, as well as vaccines for measles, polio, etc.. 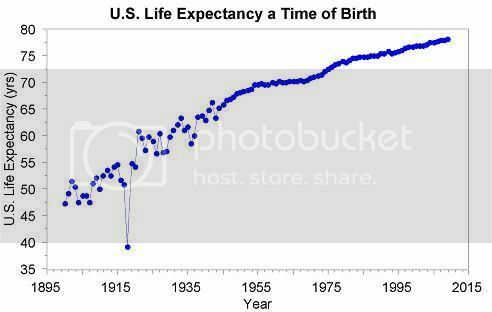 This improvement in the number of people not dying early actually precedes the 20th century. In fact, David de la Croiz and Omar Licandro, in 2015, published a paper titled "The Longevity of Famous People from Hammurabi to Einstein" which examined a dataset of 300,000 famous people. They showed that life expectancy (based on what percentage lives to full long life) has been steadily improving from approximately 1640 onward. We cannot credit "modern medicine" for our increased chances for normal life span, or even factors such as sanitation, food inspection, hand washing and other aspects of hygiene. Improved living has been going on for centuries. This is important, because some part of us wants to credit this better chance at full life span to chemotherapy, cardiac bypass, lipitor and or at least modern screening for disease and early treatment. The data simply doesn't support this. So if medicine and modern science are not causing improvements in our odds of living a long life, we have bought into a myth about what science is doing for human health. I believe this myth is what drives the research of the wealthy in California today hoping that they will crack the code of old age within present lifetimes. May you live as long as Gorgias! Batrinos, M. The length of life and eugeria in classical Greece. Hormones 2008, 7(1): 82-83. De la Croix, D. and Licandro, O. The longevity of famous people from Hammurabi to Einstein. Journal of Economic Growth 2015, 20: 263-303. The 10 Best Obesity Books. Ever.